Yadagirigutta Temple is devoted to Lord Narasimha Swamy. In Skanda Purana, the self-manifestation of Lord Narasimha Swamy is stated. Yadagirigutta is also known as Rishi Aradhana Kshetra, meaning sages worshipping place. 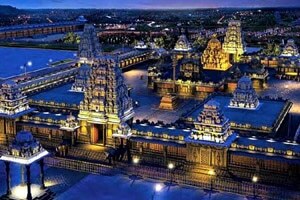 The Yadadri temple is at newly formed Yadadri Bhuvanagiri district of Telangana State. According to the legend, during Threthayugam, the son of Rishyasringa, Sage Yadava performed expiation for Lord Vishnu, after having the darshan of Lord Narasimha Swamy (one of the three forms of Lord Vishnu). With the advice of Anjaneya, Yadava moved to the base of the hillock and performed a strict penance. Lord Vishnu gets impressing with this act of Sage and grants him darshan. Sage achieves salvation and the hill became popular with the name Yadavagiri. Knowing the existence of lord, tribals living over there gathered to worship Lord. Because of ignorance, they appeased in improper practices while praying, that resulted in Lord moving up the hills. Tribals looked for the Lord but failed. Finally, one day Lord appeared in the dreams of a pious tribal woman and disclosed his whereabouts. Lord Vishnu blessed the tribals and appeared in his five avatars to them. The three natural formations of rock are admiring as the first three avatars of the Lord. The Jwala Narasimha Swamy avatar is in serpent form. Yoga Narasimha Swamy avatar is in a meditation posture. Ghandabheranda Narasimha Swamy is known to have no form here, is confessed in the form of a lamp which burns constantly within a cleft underneath the Hanuman temple. Here Ugra Narasimha Swamy is in the form of a cave entrance. Lakshmi Narasimha Swamy Silver Idol constitutes Kalyana and Vaidya form. Generally, Yadagirigutta temple timings are from 4:00 am in the morning to 9:45 pm at night. Evening Hours: 5:00 PM – 7:00 PM and 8:15 PM – 9:00 PM. After reaching the place, you can book the room at Yogananda Nilayam that is right opposite the bus station. No inquiry office is present in the hills, it is located in the town itself. We can also find the rooms on the hills. However, no online booking is available for the rooms on the hill and down the hill where a current booking is available. The temple has the accommodation facility including uphill and downhill for the devotees. And here are the details of the rooms. How to reach Yadagirigutta temple? Yadagirigutta temple is 62 km away from Hyderabad, buses are frequently available from Hyderabad. The temple is 14 km from Bhongiri bus station. The nearest airport is 91 km away from the Yadadri temple. It is in Hyderabad. Secunderabad railway station is 62 km away from the temple.